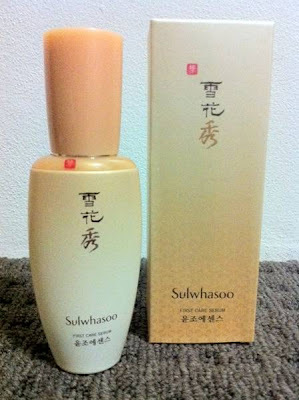 So I have been using quite a few of Sulwhasoo products for quite some time now (read: more than a few months, which I think should be ample time to test a skincare). Some of their products had been misses rather than hits; but on the other hand, I now cannot live without a few of their items. On my quest to search for a new skincare routine last year, I purchased a few lot of samples from Gmarket, including the upper end brands, like Isa Knox and Sulwhasoo. And thus my humble beginning of the serum.The First Care Serum worked beautifully on my rather oily combo skin, as a base serum to be used before toner application and without having to slap additional moisturiser. But since I knew better than to make my mind up based on a few sachets of samples, I bought a few tubs of this little gem in HongKong last November, as well as some bottles of their cleanser and cleansing oil. Boy, I spent some moola. Let's just say, if the Sulwhasoo representative got paid on commission base, the lady that served my purchase at that time would be very happy. The serum comes in 60ml fancy bottle, which will last you around 2-3 months. The cost, as I mentioned before, is on the exxy side - around A$75 when converted from my purchase in HongKong. However, this is one item that I will not be willing to give up from my daily skincare routine - broke or not! Method of usage - refer to this website. My skin is oily combination. And I hate how it seems to have its own mind during every season change. In summer, it is freaking crisco. In winter, it is drier than the sahara. Hence, my skincare routine always change every season. - Using them before applying the toner (and consequently any primer and make up after), preps the skin condition and hydrates the skin just enough so whatever the products you use afterwards are absorbed properly. In my case: the toner really hydrates the skin (hence no more moisturiser), the make up primer glides easily on my face, subsequently the BB cream and foundation powder used afterwards feels like a part of my skin, not an additional fake cakey layer. Any serums used after the toner are absorbed much easily and evenly (I notice this because the BRTC blemish serum I use becomes more effective after starting using this First Care Serum). - During winter, my skin is usually dull looking because of the dryness (and hence, I usually used to slap on additional moisturiser after cleansing & toner to hydrate them). But no more of that last winter. Yay! Apart from applying some mist water to lightly hydrate my face during the day, the serum seems to contribute to a more glowing even skin condition throughout the winter days. I admit, I still have some of Sulwhasoo product samples that I will never touch, use, let alone buy the full retail packaging, simply because they don't work for me. I notice that a lot of their line cater towards dry skin, so perhaps it will suit that market more. But I am so glad that I have found my new love with at least some of their basic skincare routine products: Liquid Cleansing Foam, Deep Cleansing Oil, and First Care Serum.